Properties in Urbanya average 4.6 out of 5 stars. In the heart of conflent, quiet, with river view of the Canigou! Property 1: In the heart of conflent, quiet, with river view of the Canigou! Property 9: Pleasant stone house with private pool and modern comfort. Property 10: Beautiful 4*villa with private heated pool in natural setting, huge garden. Property 15: Villa with garden on Mount Canigó close to ski-ing and beaches,South France. 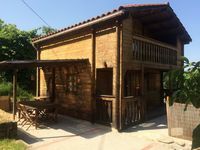 Property 31: Matemale house in the village !! Property 34: Luxury 145m2 apartment with view & SPA - 10 pers. RENT HOUSE OF VILLAGE IN SKI STATION. Property 42: RENT HOUSE OF VILLAGE IN SKI STATION. Property 43: Superb chalet with unique views both summer and winter! Mountain chalet next ski station. Property 44: Mountain chalet next ski station. Property 50: Enjoy indian summer in beautifull south of France at discount price!